The bill is due to be debated in the Dáil tonight. 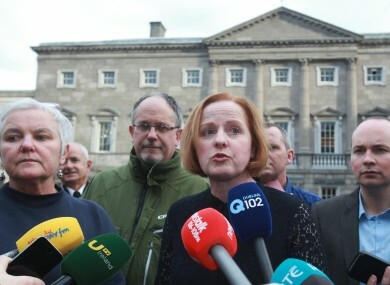 RUTH COPPINGER HAS said that it’s because of “sell-out Independents” that the AAA-PBP bill requesting a referendum to repeal the Eighth Amendment will be rejected. Earlier today, the Government took a unified position on the bill, agreeing collectively to not accept the bill until the Citizens’ Assembly has finished its work. The Government has also agreed to put forward a reasoned amendment to the bill. This is a sell-out and betrayal by the Independent Ministers like Katherine Zappone, John Halligan and Shane Ross. “Ministers, who said they are in favour of repeal, will line up and vote as part of the government against repealing the Eighth Amendment. They are putting their ministerial seats before the health and lives of women. This vote will guarantee that no referendum will take place during the lifetime of this government. “I am absolutely furious with the ‘so-called’ Independents who are co-operating with Fine Gael to practically ensure that the Eighth Amendment is not dealt with in the lifetime of this Government. To fob us off with the reliance on the adjudication of a Citizens’ Assembly of 99 people is not good enough. It is undemocratic. The Programme for Government, agreed by the coalition in the wake of lengthy talks, said the Eighth Amendment issue would be dealt with by convening a Citizens’ Assembly. In a statement today, a spokesperson said that there were different views in Government around the issue of the Eighth Amendment, but Cabinet had agreed that the Citizens’ Assembly should be allowed to finish its work. The Assembly is expected to give its report on the issue in the first half of next year. The report will then be referred to a special Oireachtas Committee which will be asked to respond to its findings within in six months. Government TDs will be given a free vote on the matter once the Citizens’ Assembly has reported back. Speaking this afternoon on RTÉ’s News at One, Children’s Minister Katherine Zappone – who is in favour of repealing the Eighth Amendment – said that she and her Cabinet colleagues had come to “mature” decision. “I think we’ve come to very mature decision in terms of how to agree,” she said. The minister said that the Government was not “technically opposing the bill” but inserting an amendment so that the Citizens’ Assembly could finish its work. “I am anxious that we ensure that the process goes as quickly as possible,” she said. The Eighth Amendment to the Constitution grants the equal right to life of to the mother and the unborn child, effectively making abortion illegal except in very rare circumstances. The AAA-PBP bill had been contentious, with members of the Independent Alliance in Government initially wanting a free vote on the matter. The Government was keen to avoid a similar situation as had occurred with Independents 4 Change TD Mick Wallace’s bill earlier in the Dáil term. Wallace had put forward a bill which would have allowed for abortions in situations where a child would not live outside the womb. The bill failed to pass, but it was backed by Minister for Transport Shane Ross and junior ministers John Halligan and Finian McGrath, who voted against government advice. Email “Coppinger blasts 'sell-out independents' after Government adopts unified stance on abortion bill”. Feedback on “Coppinger blasts 'sell-out independents' after Government adopts unified stance on abortion bill”.